I like some of Richard Linklater's movies. And I also like Jack Black's acting in many of his films and even in the rock video game titled Brütal Legend. I also think Black has done a very good job portraying the main character in Bernie. But in spite of this and contrary to other reviewers I do not consider Bernie a good movie. And even the presence of Shirley MacLaine or Matthew McConaughey cannot save it. 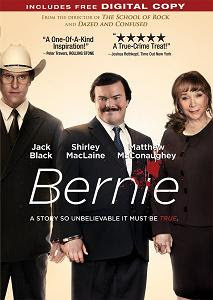 Bernie Tiede (Jack Black) is an undertaker in a small Texas town. He constantly smiles, has a lot of talents and is always ready to help people. Everybody likes Bernie and he loves everybody. Bernie is great in his work as he is in everything else. He begins a friendship with a wealthy sour widow named Marjorie Nugent (Shirley MacLaine) and both of them become almost inseparable. Bernie accompanies Marjorie in her daily routines as well as in her vacations. Marjorie shifts from a bad tempered widow to a happy old lady and in the process she assumes Bernie is her possession. One day he accidentally kills her. And then the big question is: Will the skilful Bernie be able to make dead Marjorie looking alive and outwit the townsfolk including unsympathetic district attorney Danny Buck (Matthew McConaughey)? The movie tells the story of Bernie through lots of interviews and the narration has kind of a documentary feel mixed with folklore flavor. To a certain point this actually looks interesting and it is acceptable as an artistic device. The problem is it turns less and less attractive towards the end and the film becomes pretty boring. Nothing new and surprising happens and the movie lacks a real climax. There is not a single character having to overcome any serious obstacle. The events just take place in this movie. It seems the American audience is in general more favorable to Bernie, probably because the film is based on a true story that has happened in the USA. The movie is supposed to be a dark comedy but it is not quite funny. Many of the jokes are artificial. The same is valid for the whole narrative in fact. Bernie could be a mockery but somehow the entertaining element is lost and after the ending I was more disappointed than satisfied. The acting is Ok. Jack Black fits well in the role of the chubby and sweet Bernie. Shirley MacLaine does not have a lot to say but nevertheless she easily creates the image of a pretty annoying old lady. Despite being a law representative Matthew McConaughey succeeds to be less adorable than universal favorite turned criminal Bernie. What dooms this movie most is its script and direction. Richard Linklater has been quite good in the making of Before Sunrise and Before Sunset but his re-creation of the story in Bernie won't find place on the list of my favorite films. If you haven't expected too much from the recent remake of Total Recall, you won't be "disappointed". As usual, it's (not so) debatable whether or not Paul Verhoeven's 1990 film with Arnold Schwarzenegger has needed a remake at all but the 2012 movie actually begins well and is decent till the middle of the narrative. But it looks like shortly after that point the filmmakers have decided it's time to spoil the film and they have achieved it perfectly. The story of the new Total Recall is expectedly not original. The plot is pretty much similar to that of the 1990 movie and the setting is the main difference between the two. In a future post apocalyptic world the only two inhabitable areas on Earth are a federation over today's British isles and a colony in Australia. The colony provides "cheap" labor for the federation and here is the main issue with the first part of the movie: to make it "faster" the workers travel through the center of the Earth. Douglas Quaid (Colin Farrell) is one of the factory workers who do this exercise every day. His beautiful wife Lori (Kate Beckinsale) is not enough to make him happy and he has permanent nightmarish dream involving another woman (Jessica Biel). One day Quaid decides to visit Rekall, a company implanting fake memories. But the visit goes wrong and Quaid is forced to run from the authorities and believing more and more he has been previously a spy. Total Recall is a movie that will hardly surprise you if you've seen its ancestor. It is not set on Mars but this doesn't make the film really different in terms of plot. There is still a resistance movement against the totalitarian federation regime and Quaid is not sure where to look for his origin. The two surviving areas on Earth are well crafted and one of the few highlights of the movie. Quaid and the rest of the factory workers produce robot soldiers whose purpose seems to be to protect the federation against the colony resistance, which is not very smart. If the only benefit of using colony workers were to produce soldiers fighting against the oppressed colony why would you need to master the colony in the first place. But if there has been any chance to like the movie after its decent but not so convincing beginning this chance is being completely devastated along Total Recall's accession to conclusion. For example, we are surprised by the fact the federation has not thought to search for the resistance in the most probable location. But the "best" is when Douglas Quaid decides to take a walk in his bare skin outside of a "vehicle" running with 20000 miles per hour at temperatures of several thousands degrees. Colin Farrell might be a better actor than Arnold Schwarzenegger but even Schwarzenegger rarely does such stupid things in his movies. 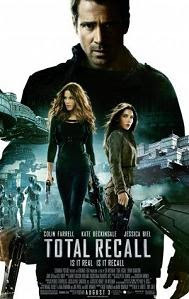 The only other bonus making this movie watchable in addition to some good visuals is the presence of Kate Beckinsale and Jessica Biel but on the other hand if your purpose is just to watch beautiful women Total Recall is hardly the most appropriate film to choose. You may read Intouchables is not original, that it is a spin-off of Driving Miss Daisy or it is not plausible. And while there is some truth in the first and the latter, Intouchables is still a very enjoyable movie and it's hard to dislike it despite its minor issues. The movie is funny, touching and hardly boring. It has been a huge box-office success in France and other countries around the world (in fact, it is one of the greatest box-office hits not produced in Hollywood and the highest-grossing non-English language movie of all time). And it deserves to be successful if only because of the good cast it sports. In spite of the numerous not so favorable critical reviews Intouchables got, the average moviegoer would most likely love it. Intouchables is about a rich man who was almost entirely paralyzed after a paragliding accident. Because of his difficult condition Philippe (François Cluzet) needs permanent cares so he is looking for a caretaker. Driss (Omar Sy) is a young black man who applies for the job only because he needs a signature on his application for social benefits. Surprisingly (for him), Driss is hired and challenged to succeed under circumstances he has never lived and worked before. And naturally, a strong relationship develops between the two men. What makes this movie so enjoyable to watch is not its premise or exceptional verisimilitude but its cast and acting. Francois Cluzet is very impressive in the role of Philippe. He uses just his head and voice, yet they are enough for making a great impact. It is easy to like his character because he is quite brave in his misfortune. Cluzet is very similar in his look and mannerism to Dustin Hoffman, in some scenes even strikingly similar. This is actually not bad since it somehow helps to relate to his character even better. Driss is intended to be in many ways a contrast to Philippe and Omar Sy fits well in this skin. He is colorful, easy-going and irresponsible at times. Omar Sy actually received the Best Actor César Award for his performance of Driss in 2012 defeating Jean Dujardin who won the Best Actor Oscar for The Artist. The supporting actors in Intouchables are also good, especially the ladies surrounding Philippe. Something that differs Intouchables from other similar movies, or Driving Miss Daisy in particular, is that Philippe likes Driss since the very beginning. Their relationship improves over time but it is apparent the young man appeals to Philippe immediately upon their acquaintance. It seems the both men do not need a lot of preparation in order to begin enjoying their time together. Philippe is almost constantly having fun and he does not need to absorb Driss' rhythm and soul to become "happier" as other reviewers suggest. It could be argued who is the "happier", the "wiser" or the more influential man and this makes the movie more entertaining regardless of its lack of an original story. The details in a movie often makes a mediocre story good as well as the opposite, a great story is easily spoilt by a weak realization. In addition to not being very original, Intouchables is also not the most plausible film. It is inspired by a true story but I am not aware of the exact degree of this inspiration. There is a certain sense of incredibility surrounding the movie yet it would be a bit strained to call it a fantasy. 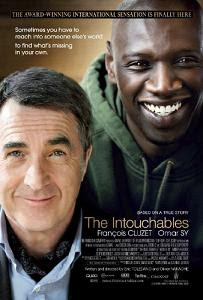 Intouchables sports decent gags, it is not overly sentimental and fills you with affection for the leading characters. If you are not prejudiced against French cinema, you should not need further convincing to see this movie.